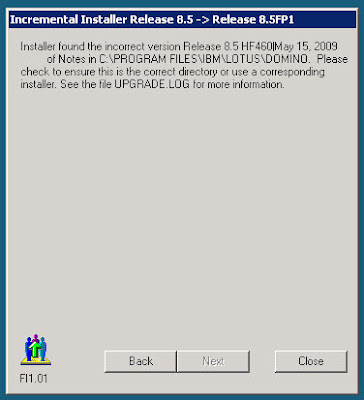 Wildunknown: How to upgrade from Domino 8.5 HF460? How to upgrade from Domino 8.5 HF460? If you're looking for answers, don't look here. I'll post a solution when I find it. First, I popped on over to the wee Irish fellow's site because I remembered seeing a link there. Downloaded the file (lotus_domino85FP1_w32_CZ344EN.exe), downed the server. Got the message above. So I thought I'd jump over to Fix Central. Noticed that the file there had a different name (DominoServer_85FP1_W32.exe), however, same problem. Uninstall the hotfix,then install fp1 or whatever, you will be good to go. sorry, no other way aside from reinstall. Yeah, you're right... I didn't want to hear it. I'm in luck. There is 'null' in my wallet.